Some time ago I discussed having fitted keyless entry and alarm systems. Two separate units. Well, I wasn’t very happy with the way they worked, never being sure if both were activated. So I purchased a single unit that did the lot, which is what I should have done from the start. Anyway one of the functions in the new unit is to lock the doors the first time the brake is applied: the signal for this comes from the brake light switch. Well the outcome from this was that I realised that I had to push pretty hard on the brake pedal for the lights to come on, not good when braking lightly, no lights to warn following drivers. What to do? 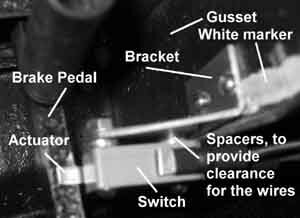 In past cars I have fitted micro switches to the clutch pedal to de-activate the cruise control, so why not fit one to the brake pedal to turn the brake lights on, as soon as the pedal starts to move? After a lot more thinking (procrastinating) I got a micro switch with 10 amp contacts and an actuator arm. Then, after much messing around I came up with a bracket and mounting place that worked perfectly. The only critical dimension of the bracket is the length of it, as it has to just clear the brake pedal. The two mounting holes, shown, should be drilled half way along the lip, both horizontally and vertically, so that the bracket can be turned upside down and used as a drilling jig. Test assemble the switch to the bracket, then use a bit of masking tape inside the gusset, where the switch is to go, where I have shown the white marker, and using a pen or pencil mark the edge of the bracket, when it is positioned such that the switch just clicks on. 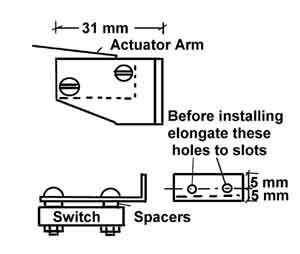 Disassemble the switch from the bracket and with a suitable drill bit hold the bracket upside down, so that the mark you have just made is against the edge and drill one of the holes. To make it easier to drill the second hole, now bolt the bracket into place, using the first hole, and then drill the second hole. Remove the bracket and now elongate those holes, in the bracket lip, in both directions, so that there is a modicum of adjustment available. Reassemble the switch to the bracket and install switch and bracket to the gusset, adjusting the position until the switch just clicks on. Now the wiring. I was lucky that I had already run a wire from the cold side of the brake switch to the alarm unit, so I just had to piggy back into this. For the hot side I ran a wire from the B terminal on the gauge voltage regulator to the micro switch, as it was quite close to the pedals. Might be different for LHD cars. Now just barely touching the brake pedal turns the brake lights on. This micro switch mod. 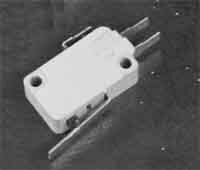 could be used in lieu of buying a new switch, and having to use relays to protect the new contacts, as these new switches are reputed to be junk.